Greg Bohn's Strictly Walleye Guide Service provides updated Vilas & Oneida County fishing reports weekly starting (May 1st - Nov 30th). Jam packed with tackle secrets & tips. Current "On the Water" walleye, muskie and trophy panfish secrets will keep you informed. Learn "What Lakes are Hot & What's Not! Join us weekly for all your Northwood's fishing tips! Minocqua Area Fishing Report - Updated 4-15-16 - 5:30 a.m.
Summary - The Lakeland Area is finally experiencing the warming trend we have been waiting months for. Many lakes are loosing their grip to ice cover, and a few anglers are fishing panfish on those smaller lakes. Noticeably a few boats and trailers have started to appear on our roadways. Panfish will remain the focal point for cabin owners and local anglers prior to the opening of fishing season on May 7th. 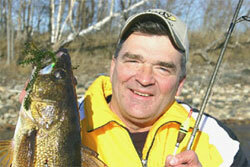 Way to early to predict what stage the walleye spawn will be for the opener, but we will keep you posted. Crappie - Ice out crappie success can be tricky. Faster action typically occurs during the Pre-spawn to Post-spawn period and warmer water. Right now, small groups of crappie (6 to 8) fish will actively search for warmer water. Don't be surprised if they appear near the surface where the warmest water temperatures are located. The sun's heat can turn-on any location quickly. Also play-off the wind, its your most important tool. Warmer surface water being pushed into any shallow location is deadly. I have witnessed and caught hundreds of spring crappie lying just beneath the surface, many with their backs slightly above the water. They resemble leaves floating on the surface. Water rings are a dead giveaway. Yes, small bays warm quickly, but its the entrance and slightly deeper water nearby that's usually the hotspot. Anchor fish, anchor fish, anchor fish! Remember, don't over tackle these ice out crappie or you'll be scratching your head. Think ice fishing, select small rigs, use light line, tiny ice jigs and hooks tipped with crappie minnows or waxworms. By a scoop or two of crappie minnows picking out the smallest ones first. Be very selective. Slip bobbers should also be ice fishing size to detect the slow bites.